Coming this fall, the Glade Arts Foundation will open The Woodlands’ premier fine arts museum at 2000 Woodlands Parkway, in the same building that used to function as The Woodlands Information Center. Thanks to the ambition and passion of the co-founders Lisa Harra, Dragos Tapu, Andy Bauman and Roy J. Villarrial, Jr., residents and visitors of The Woodlands and Montgomery County area will have proximate access to a dynamic top-tier museum and fine arts cultural center. The center will offer a uniquely enriching art experience by partnering with fine art associations and foundations across the globe to provide curated museum-like exhibits and educational seminars hosted by acclaimed artists, curators, and influencers in the world of fine art. By attracting influential and creative people in The Woodlands, the foundation will inspire artists of all ages and skill levels with arts education. The Glade Arts Foundation will offer classes and seminars focused on specific exhibits, art disciplines and techniques, art history and culture, and art’s relation to business leadership. It will also host art appreciation clubs and provide a focal point for artist to artist collaboration. Moreover, the foundation plans to designate Mondays entirely to offering free tours and workshops for various groups within the community. The foundation will enrich fine art culture in The Woodlands not only with its in-house exhibits and classes but externally as well, with permanent public art pieces, local business art projects, and sponsorship of community art festivals. It will also sponsor trips and outings to local and regional art museums, art and cultural foundations, art festivals and events, national art exhibits, and international art venues. Furthermore, the Glade Arts Foundation will offer multiple scholarships to aspiring local artists, including a full ride to a two or four-year undergraduate visual arts program. To be eligible to receive a coveted G.A.F. scholarship, applicants must be accepted into a full-time undergraduate visual arts degree program, have a high school or undergraduate GPA of 3.8 or 3.5 respectively, be involved in community service, and submit the formal Glade Arts Foundation application with a portfolio of their art works. Although most of the specific content of the museum has yet to be revealed to the public, we do know that the center will house a permanent collection highlighting the life, influence, and legacy of David Adickes, a Houston native who is world-renown for epic works like his 67-foot-tall statue of Sam Houston in Huntsville. This collection will include paintings, sculptures, and sketches by Adickes, as well as videos and literature showing his stories, influence and reflections. Other features of the museum include a glass-housed sculpture garden overlooking Lake Covey and one wing that will be entirely devoted to local Houston area artists. In addition to exhibiting their work in this section, local artists will help curate and teach classes, providing full engagement and interactive opportunities with the community. Plans are in place for the Foundation to also host symphonies and be available to rent for private events like weddings. The building has a kitchen area, so catering is a definite possibility as well. 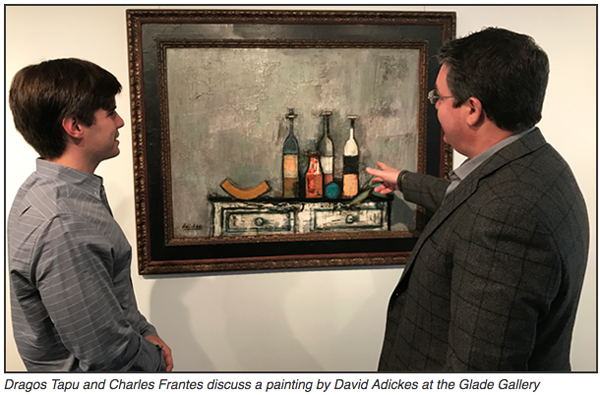 In anticipation of the grand opening of the Glade Arts Foundation, which is set for some time in November, fine arts enthusiasts in the area can visit Dragos Tapu’s Glade Gallery located at 24 Waterway in The Woodlands.